Team Maunga @ Ohaeawai School: Re-writing the Cat in the hat story. We are working on rewriting the Cat in the Hat story. This is our shared book this week. 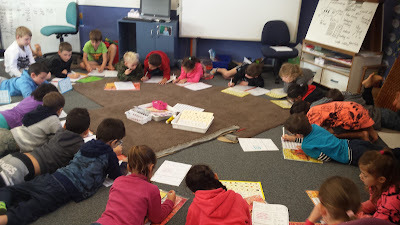 As you can see we are all engrossed in our writing. When we write/share like this, we can easily build our ideas. This helps us all to stay focused on our Learning intentions and goals. This in turns helps us to develop more interesting ideas and stories. We don't copy each other but we borrow each others ideas. This means that when we hear, read, or see a good idea, it is OK for us to use it, as long as we make it our own. This helps us to become great writers, and it also means we have a chance to help others become great writers. It makes us very proud of ourselves and our friends.